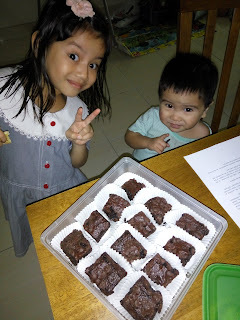 Kids had a Hari Raya Celebration at their nursery last Friday so on Thursday evening, their babysitter informed me about the celebration and asked me to bring something for the celebration. The first thing that came to my mind was to bake a butter cake and I immediately wondered if I had all the ingredients in my pantry. That night after dinner, I checked my pantry and thought of baking lemon cupcakes because I have a few lemons in my fridge. However, I have a 225gm butter while the recipe calls for a 250g butter and it is such a hassle to halve the recipe. Then I remembered that one lady posted in one of the Facebook groups about this good brownies recipe so I googled for the recipe. I checked my pantry and thankfully I have all the ingredients in my pantry. I do not have any walnuts in my pantry though so I simply sprinkled some chocolate chips on top of the brownie before baking it, just because.. I mean, who doesn't like extra chocolates, right? The recipe is so easy to follow, the ingredients are very minimal and after baking it, I can safely say that this recipe is definitely a keeper as it is fool-proof. Just make sure you follow the recipe thoroughly and you shouldn't go wrong. The recipe is aptly named The Best Homemade Brownie Mix. You see, when it says it is 'the best', I just have to try it to see if it lives up to its name. I simply used regular cooking oil because I was lazy to melt the butter and I don't have coconut oil or vegetable oil in my pantry. They worked fine and tasted just fine. The house smells like heaven and after it was done baking, I let it cool overnight. 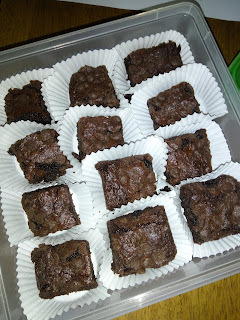 The next morning, I simply cut the brownies into little squares and put each piece on a cupcake liner and then placed them in an airtight container for Hubby to send to the kids' nursery. Don't they look nice? My kids were excited to see the brownies that morning. I managed to cut 24 little pieces and only tasted the crumbs which tasted really good. At the party, I managed to grab a slice and I was really happy with the brownies. 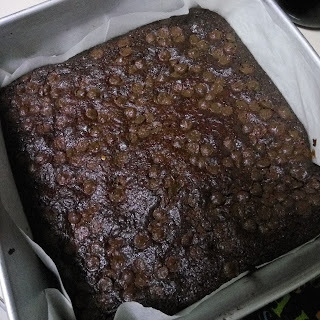 I baked it in a 9" x 9" square tin so I have some of the mix left, which I stored in an airtight container. Since I didn't really get to eat the brownies, I baked two more brownies on Sunday morning but this time with walnuts- one for my sister who is taking care of her sick baby in the hospital and one for my sister in law's Hari Raya celebration at her house. This time, I saved a few pieces for us at home so I can indulge and enjoy my homemade brownies. This recipe has been pinned on my Pinterest board, saved in my Yummly account and a copy of the recipe has also been printed and pasted into my scrapbook. No more buying boxed brownie mix after this!